This twenty year old story is easy to confirm from New York Times and Sandusky Register articles that appeared on December 26th 1998. 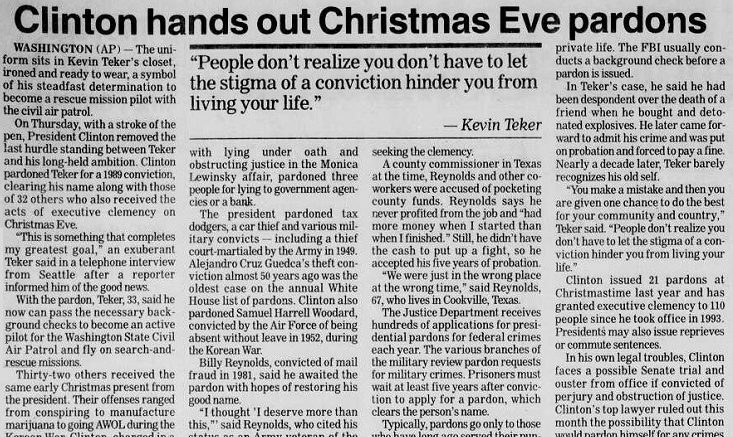 The Sandusky Register added more helpful detail in understanding the context of the pardon. In Teker’s case, we agree with him. At a young age he became despondent over the death of a friend and bought and detonated explosives. According to some reports, he later came forward to admit his crime and was put on probation in 1989 and required to pay a fine. The test makes no sense to our editors, because Mr. Teker seems to have gone on to have a wonderful life of service and contributions with or without any involvement in Civil Air Patrol. That President Clinton issued multiple pardons is known to us and AuxBeacon editors have never expressed either support or any animosity toward Mr. Clinton or Mr. Teker. Comments and article contributions from the field represent the opinions of those individuals and not those of AuxBeacon staff. We understand that some people are seeking to undermine AuxBeacon’s effort to chronicle abuses in Civil Air Patrol and the use of the organization as a political lobbying, youth indoctrination and intimidation tool to acquire more congressional votes for increased Civil Air Patrol budgets. If any reader or member becomes aware of either a Democrat or Republican politician working Civil Air Patrol to their political advantage or doing something inappropriate, they may contact us and expect the report to be vetted and released here. We log McChord’s contribution because it was submitted truthfully and respectfully and because it may be a piece of a puzzle that McChord will later expand upon. We don’t know. Be the first to comment on "Clinton Pardons Hopeful Civil Air Patrol Pilot"